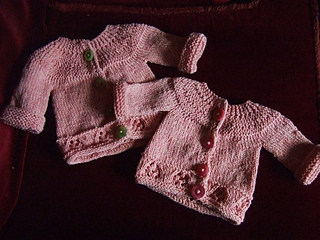 A quick and easy winter baby knit with a little lace motif for interest. Yoke is knit sideways in garter stitch, with short-row shaping, then all stitches for the front and back picked up and worked in one-piece. No seams! Sleeves are knit down from the body on dpns and have garter stitch cuffs which can be folded back to increase the lifespan of the cardigan. Pattern is written with one chart and is rated as easy.